One of the original members of Faile, Aiko Nakagawa (Aiko) was born in Tokyo and currently resides in NYC. Now working on her own projects, Aiko has released a number of handpainted screenprints over on her Lady Aiko website. 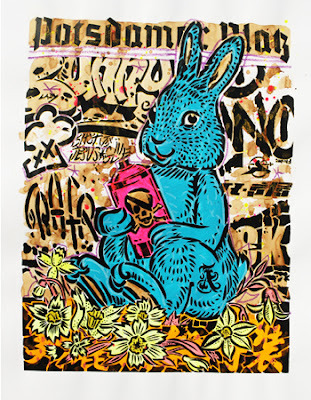 A version of these 'Bunny' prints was released through POW last month at their Santa's Ghetto exhibition. If you missed the POW prints which sold out instantly, you now have another chance to get a copy of this print. Check it here. aiko is so awesome. thanks for this. a friend just sent me a link to your blog. i love it!